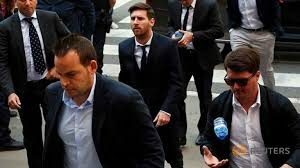 The public prosecutor has recommended Lionel Messi be acquitted following a four-day trial for tax fraud, but the government prosecutor has called for a prison sentence of 22 months and 15 days. The Barcelona star and his father, Jorge, have been charged with three counts of tax fraud worth €4.1million, relating to a period from 2007 to 2009. On Thursday, Lionel Messi testified that he “didn’t know anything” about any fraudulent activities, with his father supporting that claim. Public prosecutor Raquel Amado contended that Jorge Messi was the man responsible for defrauding the Spanish tax office and should face 18 months in prison, while the Argentina forward should be acquitted. “If there is any doubt, Lionel Messi should be acquitted,” Amado told the court.